Celtic captain given notice of complaint for conduct after the match as Gerrard faces ban. 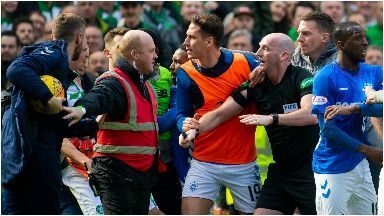 Celtic, Rangers, Scott Brown and Steven Gerrard have been charged by the SFA over ugly scenes in Sunday's Old Firm game. Two Rangers players were sent off and a melee broke out at the final whistle following Celtic's 2-1 win. 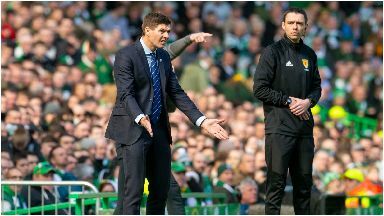 Now, the SFA have issued a notice of complaint to Celtic captain Scott Brown and both clubs, and dished out a one-match ban to Ibrox manager Gerrard. 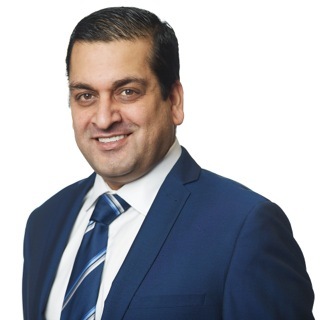 Brown has been cited for his conduct after the match, however it is understood the charge does not relate to the on-field melee following the final whistle. After the win, the midfielder was seen gesturing towards visiting Rangers fans. It is understood Gerrard's charge relates to comments made to referee Bobby Madden following his side's defeat. Celtic and Rangers have both been cited over the brawl which broke out between a number of players at the end of the game. Both are likely to face fines. In a tweet, Celtic said: "Celtic will defend these charges vigorously." Later on Thursday, Rangers winger Ryan Kent will challenge a two-match ban for lashing out at Brown during the game. 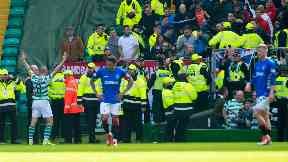 Alfredo Morelos was earlier sent off for elbowing Brown, while Andy Halliday was shown a second yellow card for confronting the Celtic skipper after the final whistle.